Colorado Lighting, Inc. is always looking for reliable, hardworking applicants who desire flexible hours and a friendly work environment. Are you customer service oriented? Do you have a semi-mechanical aptitude? Maintain a good driving record? Then consider the possibility of working with CLI’s electrical contractors! Contact us to find out more about our top-tier energy solutions and employment opportunities with CLI! 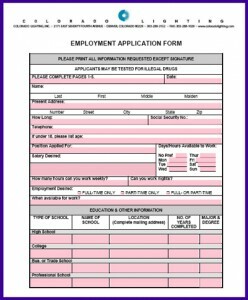 Click on and complete the Employment Application to the right to begin! Full–time employees are eligible for paid time off of one (1) full week after your first year. Our company provides eligible employees with a 401(k) Qualified Retirement plan, which is an excellent means for long-term savings for your retirement. Colorado Lighting does provide and match. Our company offers a pretax contribution option for employees. Your premium contribution are “pre-taxed” and come out of your gross earnings if you choose to participate.